The Back Squat is often referred to as the king of all exercises and this is because it works so much more than just your legs. The Back Squat is a compound movement using so many different muscle groups. Your Quads, Glutes, Hamstrings, Calves, Rectus Abdominis (abs), Erector Spinae (muscles supporting your spine and Obliques are all used during one repetition. Back Squats are an extremely effective exercise, and ought to be a part of nearly everyone's workout routine - no matter whether your goals are strength, size, or just general fitness. However, as you're going to be lifting more weight in this exercise than most others, you need to make sure you use the right equipment, and do them safely. While squatting should be a very natural movement to us, unfortunately this is not the case for most and may require a bit of mobility before you can even start to try a Back Squat. A very common limitation people will find is not enough dorsiflexion of the ankle (no range) so they are unable to get their knee to go over their toe. A way to help this while you are starting out is to place two thin plates under your heels as I have done so below. This is only to help you get started with your squats, working on mobility (foam rolling and stretching) through your calves will help build up the movement you need long term. In preparation for performing barbell squats, position an empty barbell on a squat rack at a height that's about 3cm lower than your shoulders. Load an equal amount of weight on each side of the barbell and secure the weight plates to the barbell with barbell clips. Step under the barbell and place the centre of the bar directly on the meaty part of your shoulders below your neck. If this is uncomfortable, you can use a towel or other padding to cushion the bar. The bar will become less uncomfortable as you get used to doing squats. Once you've positioned the bar on your upper back, grasp the bar firmly with your hands. It's a good idea to position your hands so that they're separated by a distance at least twice your shoulder-width. Spacing your hands too close together can lead to straining of your shoulders. With the barbell centered on your shoulders, use your legs to lift the barbell off the rack and then step back just enough to perform the exercise without bumping into the rack, as shown below. You can position your feet about shoulder-width apart with your feet and knees pointing slightly outward. Once your hands and feet are suitably positioned, you can perform the barbell squat. Take a big breathe in and start by bending your knees and allowing your hips and upper body to descend under control until your bum is below your knees. Next, breathe out and vigorously push the weight upwards until you reach the initial standing position. Make sure you are keeping your stomach as contracted as possible during the entire squat and not holding your breath. 1. Knees buckling in when pushing up out of the squat - focus on pushing your knees out externally as you are pushing up to the standing position. 2. Bending only the knees and not the hips - focus on bending both your hips and knees at the one time so you descend naturally to the ground. 3. Back rounding out during the squat which can cause serious injury to the lower back - focus on looking straight ahead and keeping your back from changing positions at all. 4. 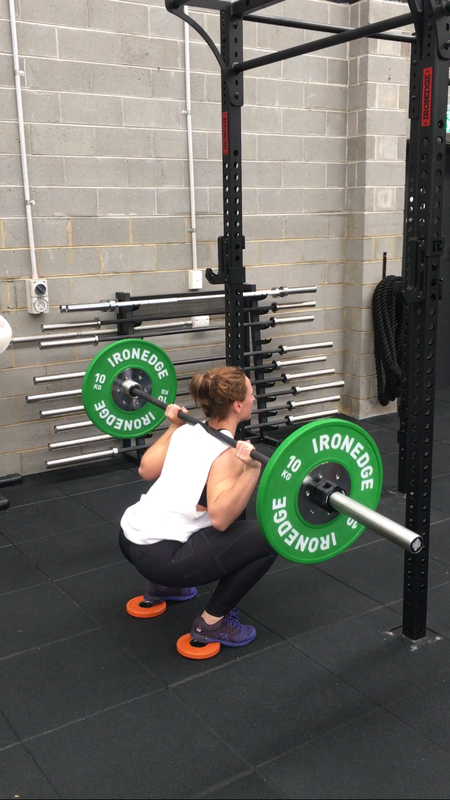 Coming to far forward and allowing your heels to come off the ground when coming out of the squat - keep your bodyweight centred in your heels when pushing up outside of the squat. Deadlifts are a fundamental exercise for our posterior chain (back of our body). These can be such an amazing exercise if done correctly. Here are some photos & tips below to create the perfect deadlift.